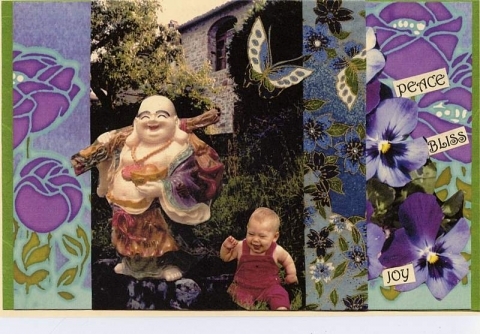 POSTCARDS FROM THE LANDSCAPE OF JOY ~ handmade with magic ~$75. Inspired by Nick Bantock's Griffin and Sabine Series, this entrancing book with inspiring collaged illustrations invites you to open envelopes and read handmade postcards as you explore the Landscape of Joy within you through a series of missives sent from the Cottage by the Sea, Honey Island. 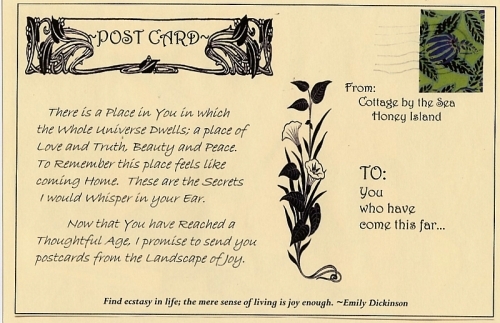 Written, illustrated, and hand assembled by Ingrid Goff-Maidoff, Postcards from the Landscape of Joy provides sanctuary as it reminds us of the beauty, peace and love we carry within ourselves. The perfect pause in a busy day, this peaceful refuge within oneself, is referred to by many as the realm of the soul, by others as the Kingdom of God and by our author as the Landscape of Joy. As you explore your inner world, you will find the place within you where the whole universe dwells: lakes of bliss, fields, gardens, marketplaces and more. 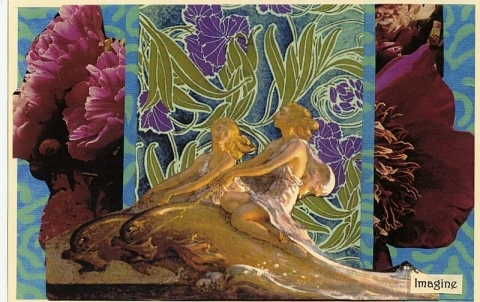 You will feel refreshed and centered in expanding peaceful joy. This beautiful treasure book is sewn by hand with golden thread and has vibrant colored illustrations. 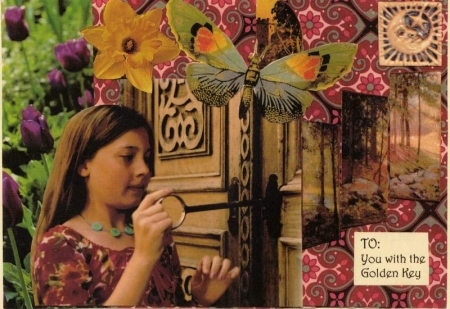 Each page is written as a postcard, or a letter in an envelope.